December 22, 2018 – NASA is turning to university students for help with the next big space technology – augmented reality. 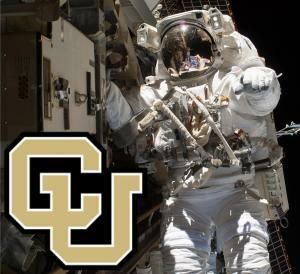 The University of Colorado Boulder has been selected by NASA as one of 16 colleges to participate in the Spacesuit User Interface Technologies for Students (SUITS) 2019 challenge. The mission? To develop an interactive heads up display system for use inside space helmets that could be used by astronauts during space walks. “The idea is to make EVAs easier. To guide them through procedures they need to follow or have someone at mission control be able to draw on the display itself to point out a component,” said Christine Chang, the CU Boulder team project manager and a computer science PhD student. The team has until April to develop and program a prototype system using the Microsoft HoloLens headset platform. Then they will travel to Johnson Space Center in Houston, Texas where a group of testers, likely including actual astronauts, will try out their prototypes. To ensure the team’s product meets the approval of such a demanding audience, they have an advisor with first-hand experience: CU Boulder aerospace faculty member and five-time astronaut Col. Jim Voss. “He’s our voice of experience. He’s done EVAs and can say, ‘Don’t worry about having the interface do X, but instead here’s something that would be really useful’,” Chang said. The team is also advised by Allie Anderson, assistant professor of aerospace engineering sciences. Anderson’s research focuses on space suit design and wearable space sensor systems. In addition to Chang, the team includes two aerospace PhD students, three computer science undergraduate, and two students from ATLAS. NASA is specifically calling the experience a “challenge,” instead of a competition. They’re not looking to crown a formal winner, they’re seeking the best ideas and designs. “NASA is particularly interested in student solutions. Students bring a fresh perspective. Someone who is 22 years old doesn’t see the same restrictions as a career scientist or engineer,” Chang said. This is the second year for the SUITS challenge, and the team is building on ideas and tests they began in 2017. In fact, their earlier work recently earned some unique recognition. After submitting an abstract on their user testing, they have been invited to participate in the 2019 International Conference on Environmental Systems in Boston, Massachusetts in May. If you are a student interested in joining the team, they are accepting new members. Email NASAsuits@lists.colorado.edu.